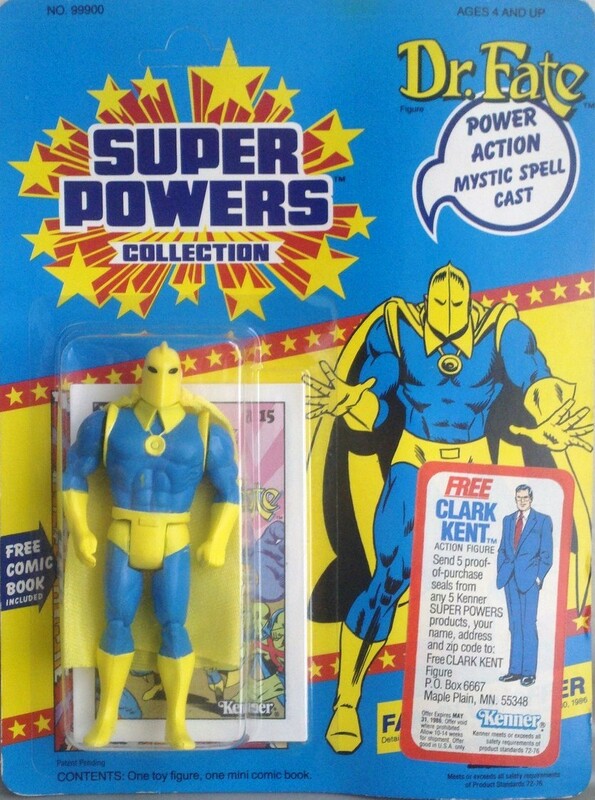 Aesthetically speaking, ever since I first laid eyes upon his Super Power Collection action figure, Dr Fate was always one of my favorite DC characters. What's not to love? The yellow-and-blue color scheme. The ominous face-covering helmet. The big sweeping cape. He's pretty easy for an eight-year-old to draw. And the cherry on top: it's impossible to define his powers. What does he do? Just about anything. Can he beat Superman? Probably. Can he beat the Spectre? Maybe. Gardner Fox and Howard Sherman struck gold when they created this character back in 1940. 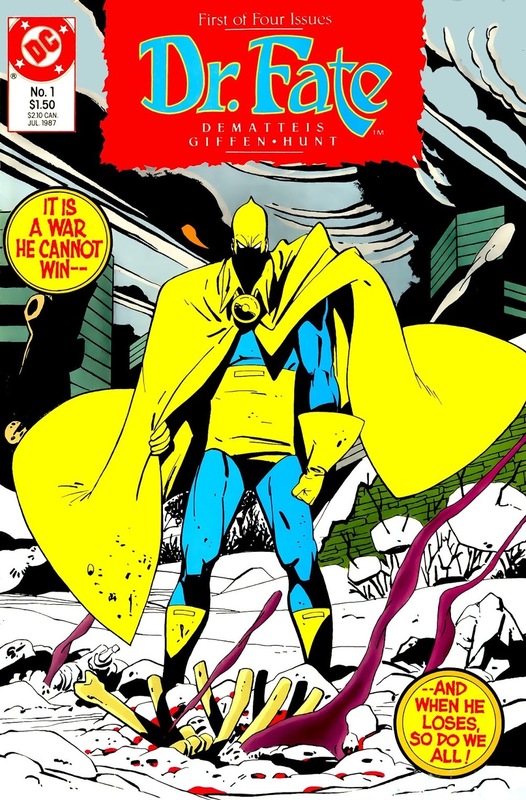 I'm pretty elated to be re-reading the 1987 Dr Fate mini-series for this review. 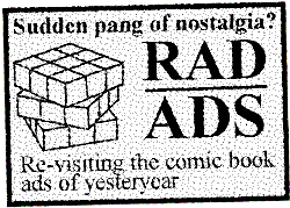 The year was 1987. DC was still trying to sort itself out with all the post-Crisis reboots and continuity conundrums. 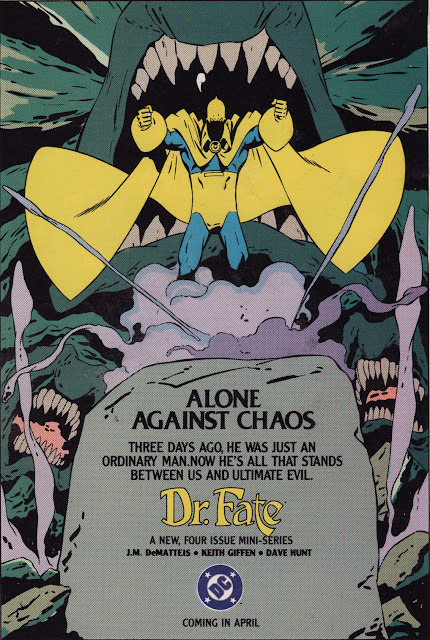 Dr Fate, who was now part of earth-one DCU thanks to Crisis On Infinite Earths, had been appearing in the new and very well-loved Giffen/DeMatteis/Maguire Justice League ongoing series. It was an excellent time to revamp the character and get a new mini-series out there since interest in Dr Fate was at an all-time high. 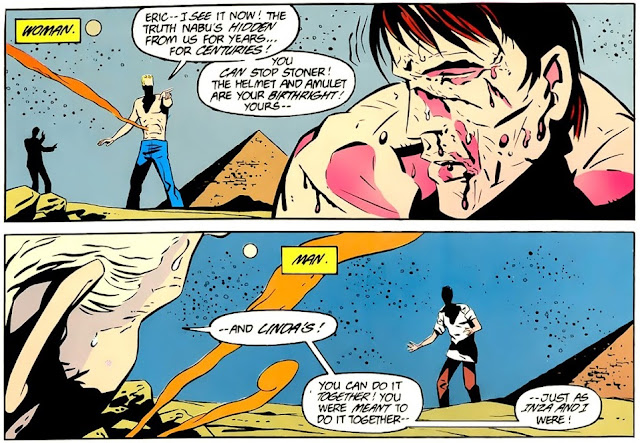 As an aside, for anyone who wasn't already familiar with Dr Fate from Roy Thomas' recent All-Star Squadron comics, you could've pick up The Immortal Doctor Fate three-issue deluxe reprint series that was released in 1985. With a creative team of J.M. DeMatteis (writer), Keith Giffen (penciller) and Dave Hunt (inker), the house ad for this new Dr Fate mini-series... didn't really give anything away. I mean, it would appear that Dr Fate would be fighting some big monsters... but other than that, we had no clue that anything drastic would be happening in this mini. Needless to say, we were probably a little unprepared for the bombshells J.M DeMatteis and company would be dropping on us. 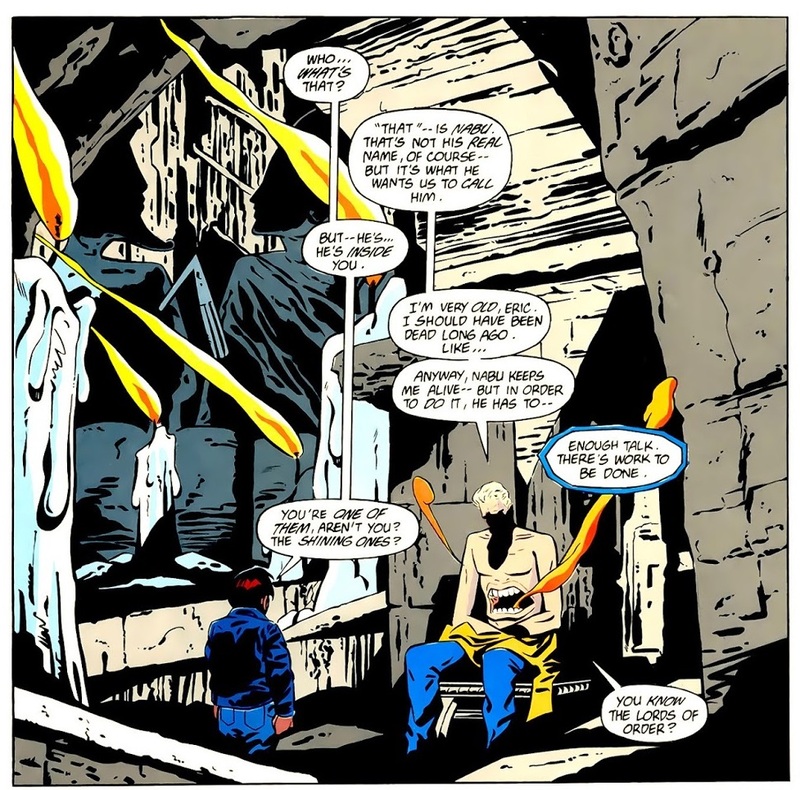 True to the spirit of Dr Fate, it's a very odd story. I'm telling you right now that this review is full of spoilers. If you want to stop reading this review, seek out this mini-series and read it on your own and be surprised, go ahead and do so. It's worth it. I absolutely love this cover. Hell, I just love Keith Giffen art. 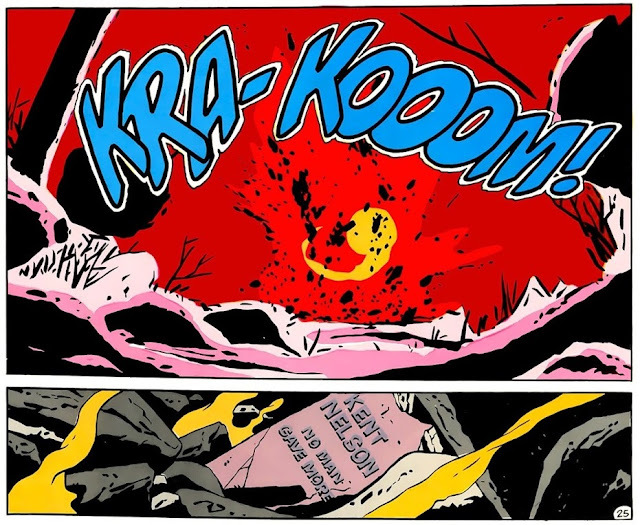 Kent Nelson is dying, or -- more specifically -- Nabu's host body is burning out. It's more or less revealed in the first issue of this mini-series that Kent is no longer in control when he wears the Dr Fate helmet and that Nabu is in the driver's seat. It's also revealed that Nabu is a Lord of Order. (I can't remember if this is the *first* instance of Dr Fate being named a Lord of Order, but either way, it's spelled out for the reader in this issue.) The Lords of Order want Nabu to cease his never-ending battle with the forces of Chaos since, according to the Yuga cycles, Chaos is just going to win anyways and then the cycle will restart... so why not just let this thing play itself out and they can restart the cycle from the beginning, and Order will come into power again? 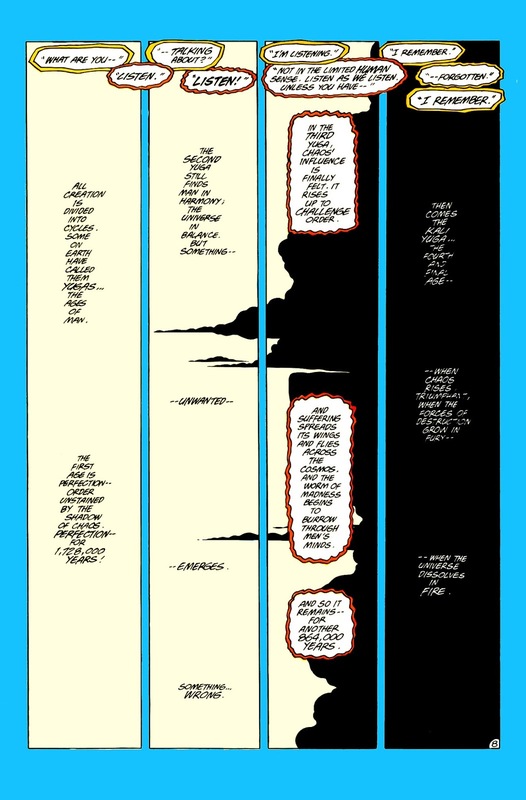 panels from Dr Fate v1 #1 (1987). Pencilled by Keith Giffen, inked by Dave Hunt. 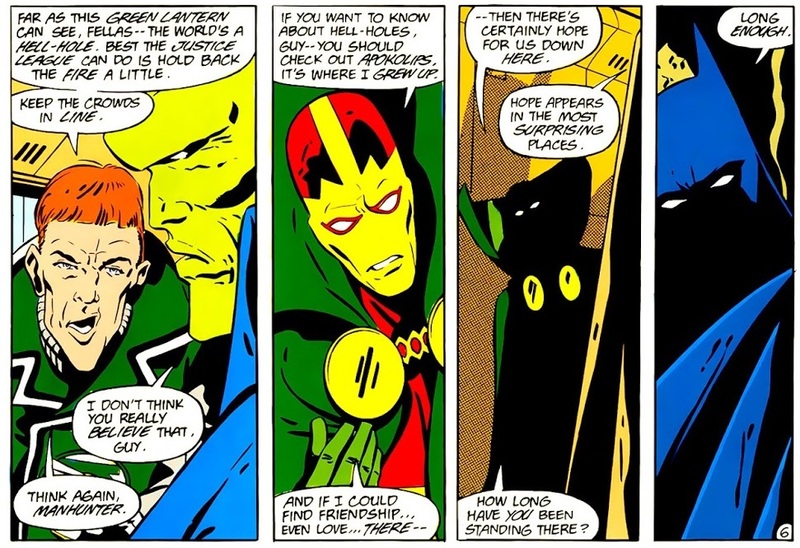 Despite the sage advice, Nabu decides that he needs to find a new host to keep on battling the Lords of Chaos. Enter: Eric Strauss. Eric is a 10-year-old boy who has always known he was destined for greater things. Kent Nelson goes out and abducts Eric from a playground so Nabu can begin training Eric to be the next Dr Fate host. Dialogue between Kent Nelson and a young Eric Strauss. 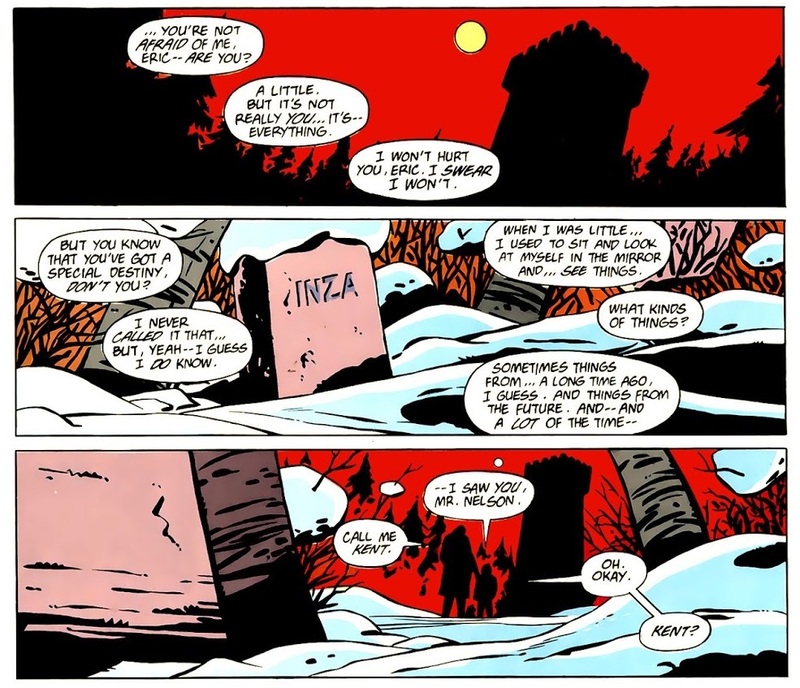 Note the close up of Inza Nelson's gravestone. panels from Dr Fate v1 #1 (1987). Pencilled by Keith Giffen, inked by Dave Hunt. A 20-year-old Eric Strauss. Hey, that's Kent Nelson in the background! Why does he have a mouth in his abdomen? page from Dr Fate v1 #1 (1987). Pencilled by Keith Giffen, inked by Dave Hunt. Also introduced in the first issue: Dr Benjamin Stoner. Don't let the fact that he works at Arkham Asylum fool you: this is the first appearance of Dr Stoner (aka: he's not an already-established Batman villain) and he will re-appear at least once in the 1988 Dr Fate ongoing series. Dr Stoner takes his orders from Typhon, a Lord of Chaos, who also makes his first appearance in this mini-series. The menacing Dr Benjamin Stoner. 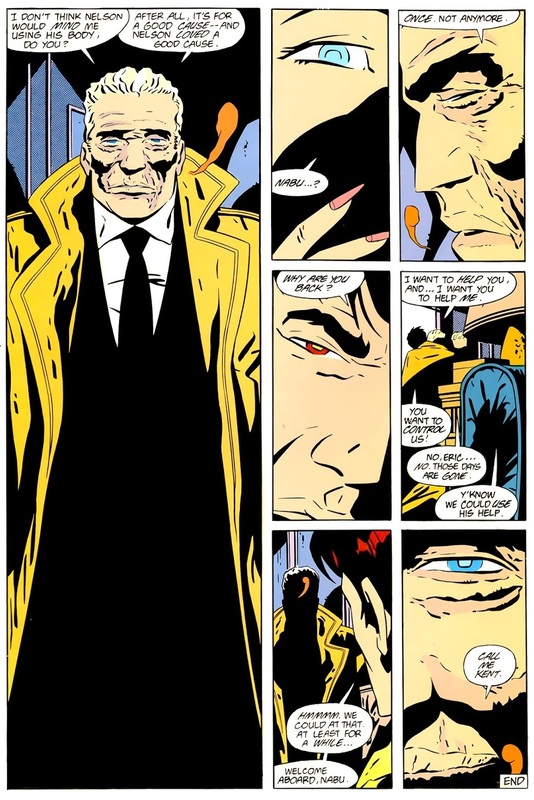 ...and finally, there's Kent Nelson -- the golden aged Dr Fate. He's looking pretty rough; that mouth coming out of his stomach is a dead giveaway. Also worth noting: Inza Nelson is dead. 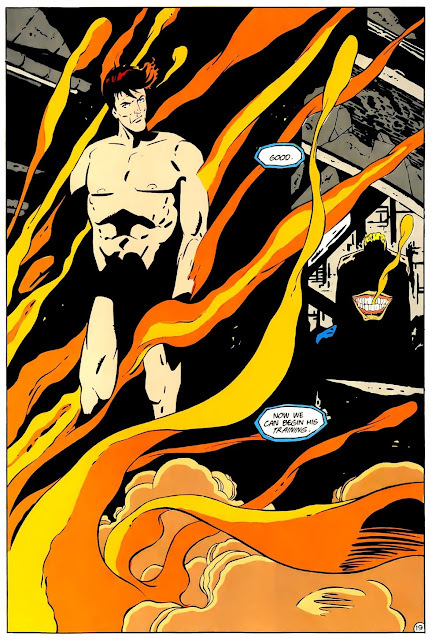 DeMatteis spends the first issue of this mini-series turning everything you thought you knew about Dr Fate on it's head. It's all very weird and intriguing and, as far as sheer entertainment value is concerned, I just can't help but want to read more. Nabu, Kent Nelson and a young Eric Strauss. panel from Dr Fate v1 #1 (1987). Pencilled by Keith Giffen, inked by Dave Hunt. As the story progresses, DeMatteis really delves into the whole 'Nabu is a manipulative jerk' idea and has Kent Nelson lashing out about Nabu's wicked ways. A sub-theme of this mini is Kent Nelson coming to terms with the fact that Nabu robbed him of a happy life, and that Nabu is really no better than a Lord of Chaos in the end. Kent Nelson reflects. 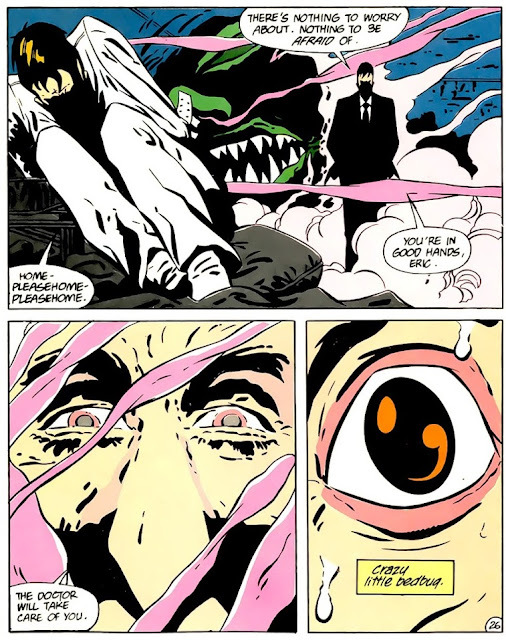 panels from Dr Fate v1 #2 (1987). Pencilled by Keith Giffen, inked by Dave Hunt. This is how Linda feels about Eric -- and she's not even aware he's an adult now. panels from Dr Fate v1 #2 (1987). Pencilled by Keith Giffen, inked by Dave Hunt. Coincidentally, Linda Strauss is twenty-eight-years old... and already feels a "connection" to this young boy. Hmmm. I wonder what's going to happen when Linda discovers that Eric has been suddenly aged to a twenty-year-old? Hmmm... I'm getting flashbacks of Hal Jordan and Arisia here. 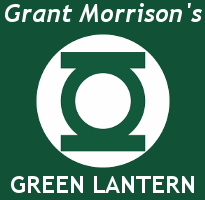 panel from Tales of the Green Lantern Corps #1 (1981). Art by Joe Staton and Frank McLaughlin. I've read enough four-issue minis' to know that in order to keep it interesting, at some point the antagonist needs to overpower the protagonist just so we can see how much damage and destruction would be caused if the protagonist gave up. 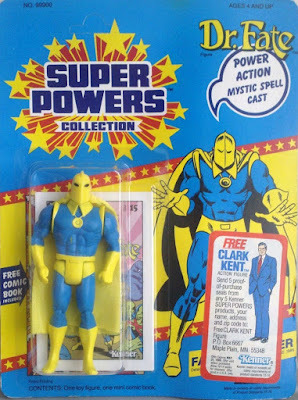 This mini was no exception; Dr Stoner does, in fact, get possession of Dr Fate's mystical helmet and sacred amulet, he becomes a new Dr Fate (anti-Fate?) and plunges the world into chaos. This appearance of Ronald Reagan here for no other reason than I collect images of Reagan from DC comics. 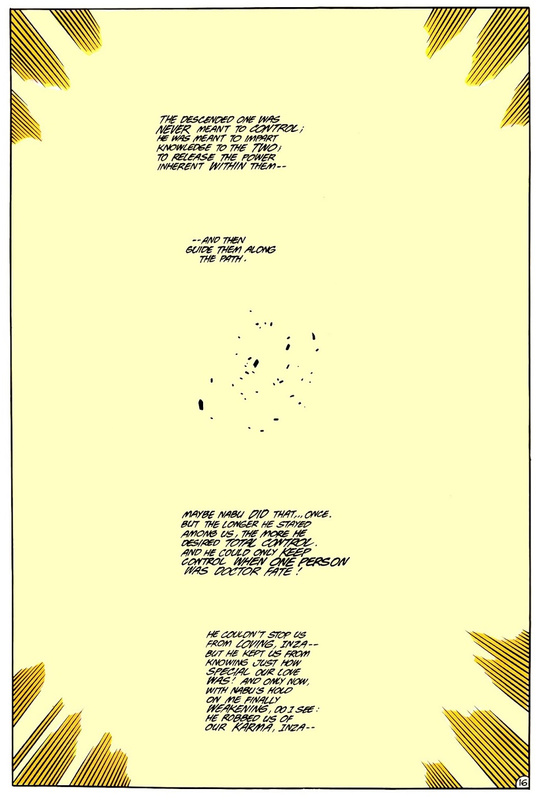 panel from Dr Fate v1 #3 (1987). Pencilled by Keith Giffen, inked by Dave Hunt. The Justice League and the Phantom Stranger make a special appearance in issue #3. Actually, they take up half of the issue. Not that I'm complaining -- seeing Keith Giffen illustrate and Dave Hunt ink the Justice League is just one more reason to hunt down and purchase this mini-series. 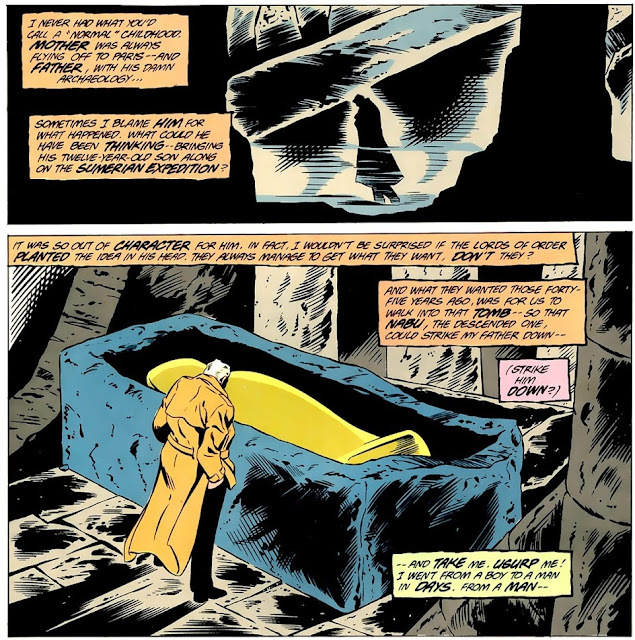 panels from Dr Fate v1 #3 (1987). Pencilled by Keith Giffen, inked by Dave Hunt. On the topic of the Justice League, after this mini-series, Dr Fate would appear in only ONE more issue of Justice League International (it was a Millennium cross-over, too) and that would be it. panels from Dr Fate v1 #4 (1987). Pencilled by Keith Giffen, inked by Dave Hunt. page from Dr Fate v1 #4 (1987). Pencilled by Keith Giffen, inked by Dave Hunt. 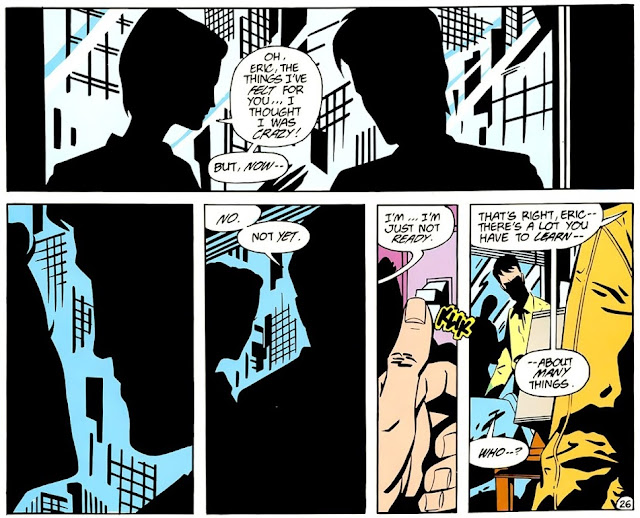 The mini-series reveals that Dr Fate was always meant to be the aggregate of two human hosts. Kent and Inza Nelson were always meant to be merged into one, but Nabu put a stop to that... because he's a manipulative jerk. So that explains the whole Eric/Linda connection: she felt a 'connection' to him (easily confused for love) because they were meant to be the new Dr Fate! That explains it. Well... so much for that theory. So, this is the part where I try to defend the weird Eric Strauss/Linda Strauss relationship dynamic. Keeping in mind that J.M. DeMatteis had a consciousness-altering experience when he was 17 years old that set him on a course towards the teachings of Meher Baba, it's safe to presume that the teachings of Meher Baba's most popular book, God Speaks, The Theme of Creation and Its Purpose, had a big impact on DeMatteis and his story-telling. As it so happens, reincarnation is a central tenet of Meher Baba's teachings. 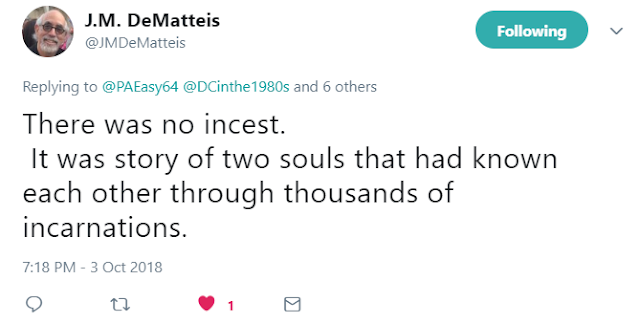 Thus, I'm choosing to explain this away as reincarnation -- Eric and Linda were meant to be together, and were probably together in a previous lifetime... but it just so happened that Linda was reincarnated thirteen years sooner than Eric. There. Something that, at first glance, may appear to be confusing and creepy can now be explained away as mystical and slightly romantic. * Anyways, will Eric and Linda be able to sort this out? Well, not in this mini-series, so we'll need to wait for the ongoing series to see how this unfolds. God bless you, social media! Kent Nelson, who finally get the peace he's been longing for, is unceremoniously re-animated by Nabu to be his living vessel (again). So, how did I enjoy this mini-series? I loved it. It's the perfect storm of 'excellent storytelling about a character I've always been interested in' combined with 'art that I just can't get enough of'. 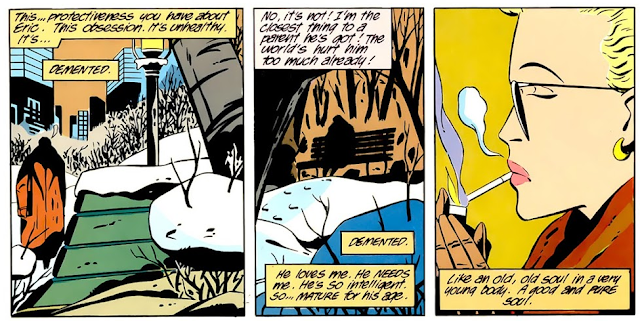 Giffen does a great job with setting a dark and ominous tone to this mini-series; he includes lots of shadows and lots of things with sharp teeth. This is my favorite kind of Keith Giffen art -- it's bold and dramatic, it's heavy on contrasts, it's filled with vibrant colors and has a 'pop art' feel to it -- it's the same Keith Giffen art that had me take a look at Legion of Super-Heroes with a new set of eyes. You can find similar Giffen art in The Heckler and the Ambush Bug minis and specials. A major appearance by the Justice League was just the icing on the cake. 1) Dr Fate is now a composite of two people: Eric and Linda Strauss. I'm not sure how this is going to play out -- will it be a 'Firestorm thing' where, when they merge, Eric is the body while Linda is a voice in his head? I guess we'll need to wait for the ongoing series. 2) Kent Nelson is back -- but he's actually Nabu. Yeah, that won't be confusing at all. To be honest, I just kinda feel bad for Kent... all he wants to do is rest and be with his late wife, Inza. 3) Dr Fate got his powers (of a sort) in Cairo, Egypt and his magic was always being represented with an ankh (a symbol of life used in ancient Egypt) -- so I'm pretty surprised to learn that there's some Hinduism mixed in there. Coming up next: The 1988 Dr Fate ongoing series.